Glass swirl bottles measure 1-1/4R x 4-3/8H each and have plastic pop off bottle cap for easy filling and cleaning. Each shaker cap have 5 holes. On the bottom of each bottle is a B in a circle representing the Brockway logo. Under this is a number. 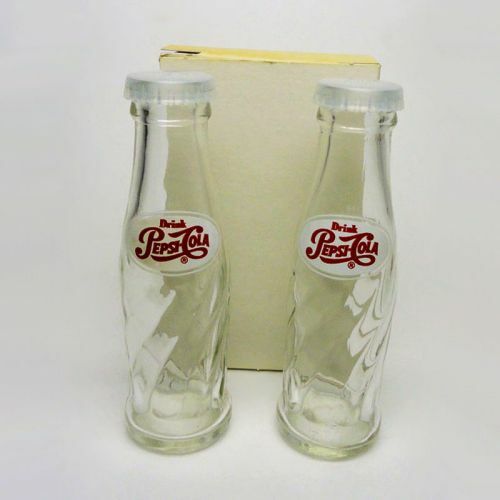 These Pepsi salt and pepper shakers came from the estate of a longtime Brockway Glass employee who many years earlier had placed the original shipping box containing these old salt and pepper shakers in his garage and left them there. I am the only person to touch them and that was just to take photographs and then it was replaced. The shakers still have that new feel and are squeaky clean.